Often considered an enigma, a myth, and to some a legend, George Latterman is a man who knows no bounds. 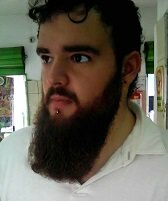 George was born in New York with dual citizenship, sharing his nationality between the United States and Brazil. After becoming interested with high level table tennis when he was 18, he spent time practicing in both countries and is one of the top players in the capital region of New York. The brand of Double Happiness, commonly referred to as DHS, is a name with many connotations. With it comes to mind the Chinese national team, Hurricane rubbers, and setting the standard for what Chinese style rubbers should play like. Like many people, I have always considered DHS to be the best Chinese table tennis equipment manufacturer. They have a large variety of products and seem to have something for almost everyone, especially when it comes to blades unless you consider yourself a chopper. DHS seems to give the cold shoulder for those players but that's a topic for a different time. That all said, people often (unnecessarily in my opinion) criticize the company for its lack of consistency for its commercial versions of their in house Chinese made rubbers, especially Hurricane 3. So, with Goldarc 5 and Goldarc 8, DHS has worked with Germany's ESN, famous for producing the majority of European rubbers. It's important to note that these Goldarc rubbers are not only completely non-tacky but that they are also not Chinese in style whatsoever. These are ESN made rubbers and in a blind test I would never guess that these are associated with DHS in any way. In my opinion, this was a good decision. This isn't the first attempt DHS has made at creating non-tacky rubber. Frankly, those rubbers fell mostly flat and never quite lived up to the more famous EuroJap rubbers they tried to emulate. Will these newest entries into the Goldarc series hold up? Let's find out! Goldarc 5 features a somewhat medium hard topsheet and comes in 2 different flavors of hardness: 47.5 and 42.5 degrees. The topsheet has some grip but I'm not about to write home about it. I'll explain what I mean in a bit. While there is a difference in hardness between the 2 sponges, I never felt like it made a significant difference in how this rubber plays and what it is meant for. 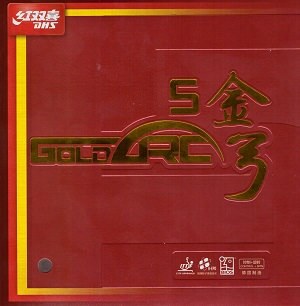 My first impression of Goldarc 5 never really changed even after using it over time. To put it simply, this is a $15 rubber that sells for twice the price. Is it a bad rubber? No, it's not, I just find it costs more than it should. You can find similar rubbers from different Chinese manufacturers that sell for $15 and often less. What I mean by this is that it has no glue effect or feeling of that kind at all. This leaves the sponge feeling kind of dead and makes it feel kind of boring to play with. This rubber is pretty much Mark V, a rubber which also costs about $10-$15 more than it should. With that said, this rubber is pretty much Mark V. It has that same kind of controlled offense to it. It can loop consistently but still flat hit reliably. It might not have a glue effect but that doesn't make it a defensive rubber at all. When using this type of rubber, the idea is to make sure the ball lands on the table. You're not trying to overpower your opponent and blind them with speed. The throw angle of this rubber is rather medium and encourages mostly active strokes since you can't expect much free energy out of it. This slower speed helps it be fairly insensitive to incoming topspin. If you're not used to using this kind of classic style rubber, looping into the net can happen at first since it doesn't have the same kind of automatic projection that a glue effect rubber would have. Once you get used to it then you'll see that it's quite consistent. There are no surprises with Goldarc 5. I think the number 1 advantage of using a classic style rubbers like Goldarc 5 and Mark V is that it allows you to play full strokes without feeling like you're going to overshoot the ball. This is great for people who are trying to develop their strokes. Also, if for some reason you don't like the feeling of a modern glue effect rubber, this is definitely an option. Serving with this rubber allowed for good placement. As mentioned earlier, the topsheet has grip but it's nothing special. Not only is the sponge classic in style but so is the topsheet. Serves can generate enough spin to be safe and do what you want but it doesn't quite reach the extreme level of spin that most other newer rubbers are so good at producing. The slower sponge is definitely a benefit since it reduces bounciness which can hurt serving but it's nothing compared to a good tacky Chinese rubber in this department. Naturally, as one might expect, the short game is pretty controllable with Goldarc 5. Flicking makes it to the other side of the table and pushes can be kept short. I think the best part of the short game with a classic style rubber and with Chinese style rubbers especially is that you can push against an incoming dead ball quite well with much less risk of popping it up compared to faster modern rubbers that might cost you the point with a high ball return. Chopping was doable, but the harder a rubber is, the more difficult it is to chop with for me. The 42.5 degree version was a little better for this as a result but I didn't really enjoy or feel secure in chopping with this rubber. It just felt inconsistent for me. Blocking lands on the other side of the table consistently but isn't particularly threatening due to the lower speed. Chopblocking is doable but I personally like both a softer sponge and a softer topsheet but I guess that's just my opinion. I also didn't use it much on the backhand where the vast majority of chopblocks happen but even when using it on the backhand I couldn't really get the proper feeling for it. Automatic lifting and fishing with Goldarc 5 and classic style rubbers are not that great. I feel these strokes benefit greatly from the speed and pop of a glue effect rubber. Without that characteristic, Goldarc 5 sends flatter balls that would be lucky to make it to the net. Lobbing can be performed but it's nothing that great and again, would benefit greatly if it were a faster rubber. Driving is alright with Goldarc 5. The throw angle isn't too high and with its medium arc allows for a fair balance between looping and driving. Of course, this rubber isn't about win any awards for driving but it allows you to execute a full stroke and let's be honest, you can grab a pillow from your bed and if you can pull off a full stroke, even that will produce a ball with some pace. Despite its fair ability to drive, I would say Goldarc 5 leans more on being a looping rubber. Loops of all kinds are consistent and fairly easy to do once you get used to the rubber. Looping backspin yields a clean arc and fair clearance with decent pace. The rubber can counterloop but unfortunately, as is the case with most classic style rubbers, it does a poor job of combining your opponent's power with your own. If you want any kind of pace on your counterloops, expect to put in the work necessary to do so. Even then, this rubber lacks high gears so don't beat yourself up too hard if your attacks aren't as powerful as you expected them to be while using Goldarc 5. Goldarc 8 features a somewhat medium-soft topsheet and comes in 2 different flavors of hardness: 50 and 47.5 degrees. Unlike Goldarc 5, Goldarc 8 is a true tensor. The inherent grip of Goldarc 8 is on a similar level to Goldarc 5, however, 8 has a significantly softer topsheet that is also more elastic. This increases dwell time relative to that of 5. Just like 5, the difference in hardness between the 2 sponges, while perceivable, does not change how the rubber is to be used. Immediately after trying Goldarc 8 I enjoyed the sensation and comfort that the rubber gave. This is a very easy to use rubber. While 47.5 and 50 degrees are often considered to be quite hard by ESN standards, surprisingly, they felt considerably softer and quite lively. Even the 50 degree version of Goldarc 8 felt softer than the 47.5 degree version of Goldarc 5 and also more lively than the 42.5 degree sheet. Despite the lively and elastic feeling of Goldarc 8, I wouldn't consider it a fast rubber. It may be faster than 5 but it's on the lower end of speed for ESN tensors, especially of equal sponge hardness. While some might consider this a drawback, personally I found it to be a breath of fresh air. In a market full of blindingly fast rubbers or dead and slow classic rubbers, Goldarc 8 allows for the wonderful pop, elasticity, and performance of a modern tensor with a realistic speed that is more than powerful enough to finish a point but caps off at a certain level to maintain a high degree of control. I was surprised at how well I could perform almost all strokes with this rubber. The throw angle was medium, maybe medium high. Despite the slightly higher throw angle of 8 compared to 5, I found that it wasn't particularly more sensitive to incoming topspin and that I had a greater sense of control because I could actually feel the incoming ball on my racket. This allowed me to place the ball better and to put it simply, land more balls on the table. A lot of people automatically write off tensors as too difficult to use for lower level players. On average, they are correct. Most tensors seem to be too fast, too sensitive, or have various other characteristics that are detrimental to a developing player. While I would not suggest a total beginner use Goldarc in their first 6-12 months of playing, after that point I would say that Goldarc 8 is an excellent choice. It's honestly an excellent choice for low level players all the way up until just before a high level. Serving with Goldarc 8 was good but not great. As stated before, the topsheet grip is similar to Goldarc 5. As a result, I'll repeat what I said with 5. Serves can generate enough spin to be safe and do what you want but it doesn't quite reach the extreme level of spin that most other newer rubbers are so good at producing. The slower sponge is definitely a benefit since it reduces bounciness which can hurt serving but it's nothing compared to a good tacky Chinese rubber in this department. In the short game, I found Goldarc 8 to be good at playing offensive shots that were close to the net. Flicks were capable of having good pace and were very easy to perform. Placement of pushes were very good but again, I would have liked a little extra grip to impart more backspin. While not exactly bad at it, sending backspin balls to your opponent is not the main forte of Goldarc 8. This brings us to chopping. Chopping with Goldarc 8 was interesting. Chops had excellent feeling. I had control over placement, speed, depth and it was all quite comfortable to do so. I'm not very good at chopping on the forehand at all (not that I'm trying to be) but with this rubber I was able to chop back one or two extra balls that with most other inverted rubbers I would not have. Unfortunately, I had some trouble creating heavy backspin on my chops. As I just said, sending backspin is not what Goldarc 8 is meant for. I truly love blocking with this rubber. Goldarc 8 gave me the feeling that there wasn't a loop too spinny or a drive too fast for me to block. As far as inverted rubber goes and my personal tastes go (I usually like blocking with softer rubbers), this rubber is probably the best blocking rubber in the 47-50 degree range. While sure, the topsheet is not very sensitive, it's the sponge of Goldarc 8 that allows me send back a variety of different blocks. Chopblocks had the right amount of feeling and dwell time for me to take command of the ball and I was able to control the pace, placement, and depth of the ball to a significant degree. The sponge allowed me to kill the pace, send back what was given to me, or double the energy by combining it with my own. This is a really great rubber for this stroke. Lifting and fishing with Goldarc 8 is also quite good. The great deal of elasticity allowed fishes to be performed with great control and feeling. They had decent top/side-topspin and its height could be varied. Close to the table lifting was also good as there was enough pop in the sponge to send it back with little effort but not too much as to send it off the table. While Goldarc 8 is capable of driving, its slower speed doesn't make drives shine. Its softness and relatively reduced speed prevent it from reaching the highest gears a drive can reach. It does make them consistent however. The question though, is do we really need it to be so fast? For 99% of us, the answer is almost never. This isn't to say that driving with Goldarc 8 is slow, only that sacrificing a notch or two at the upper gears might actually be worth it if it means my drives land on the other side. For rubbers of a similar hardness, Goldarc 8 is one of the easiest rubbers to counterloop incoming topspins. Again, it's not the fastest and you will not get extreme spin. What you will get is enough speed and spin but most importantly you will get reliability and consistency. Speed can be maintained up to mid distance and will drop at long distances but the ball can still make it back. I would just suggest keeping it no longer than mid distance if you can. The feeling and the comfort of Goldarc 8 really make counterlooping and even close to the table countering a very easy task. A lot of rubbers struggle with taking a ball early but this rubber is great at that. I will say that I wish it had more grip when looping backspin though. Looping long backspin requires a very upwards motion and the spin wasn't quite as high as I would have preferred but was still decent. Looping half long backspin felt almost impossible on the forehand side. The backhand side allows for easier mechanical grip when close to the table so looping half long backspin on the backhand side was much easier than on the forehand where I prefer a more brushing motion to deal with these types of balls. Though for the most part, most kinds of looping with this rubber were very easy to do. Goldarc 5 and Goldarc 8 are really completely different rubbers. They share a name and are inverted rubbers but that's where most of the similarities stop. While both might be considered control rubbers, Goldarc 5 has control for the wrong reasons; it is slow and dead like Mark V. Goldarc 8 on the other hand, has control for all of the right reasons; it is designed to give the user a greater ability to manipulate speed and spin. If there is to be a winner here then the winner is... the sponge of Goldarc 8. The topsheets of both 5 and 8 are nothing too special. Goldarc 5 would have been better in the 20th century with toxic speed glue and a 38mm ball. I think the topsheet of Goldarc 8 would have been even better with the 40mm celluloid ball. The true winner of this review is the sponge that lies underneath 8 (both 47.5 and 50 degree versions). Never before have I encountered a sponge with such hardness and yet so much control. I feel that if a rubber that uses the same type of sponge with a topsheet that has at least the same level of elasticity as seen on Goldarc 8 were to combine extra grip and spin to the topsheet then we may just ourselves a new people's champion. I'm also curious to see what it would be like to see this sponge in even softer versions. I'm talking about less than 40 degrees. I like soft backhand rubbers and I wouldn't mind trying that if something like this was ever made in the future. Goldarc 5 isn't necessarily a bad rubber if someone hands you a sheet, it's just a bad rubber if you spent more than $20 for it. Goldarc 8 however, is very much worth every penny. 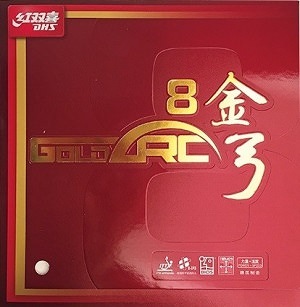 If you are looking for a harder rubber with more control without sacrificing much in glue effect feeling, speed, and power; I highly recommend Goldarc 8. Take it from me, I won a local tournament using this rubber on the forehand so I was definitely left satisfied! If you've made it this far and are reading this, thank you so much for taking the time to read my review. The review of Nittaku Hurricane Pro 3 Turbo Orange! The review of the entire DHS Hurricane 3 series! The review of Hurricane 8 Hard and Mid-Hard!